Happy new year, loves! I took a break from blogging for the holidays and to MOVE. That’s right, the house is finally under contract and we close this week. Thank you sweet baby Jesus, the house is finally sold and we are all under one roof! However, that roof is a 2 bedroom apartment that clocks in at 1040 square feet (down from 1906 sq. ft. at the house). We sold a lot of our furniture, especially any DIY/painted stuff and oversized pieces, so we are learning to live with less in a smaller space. 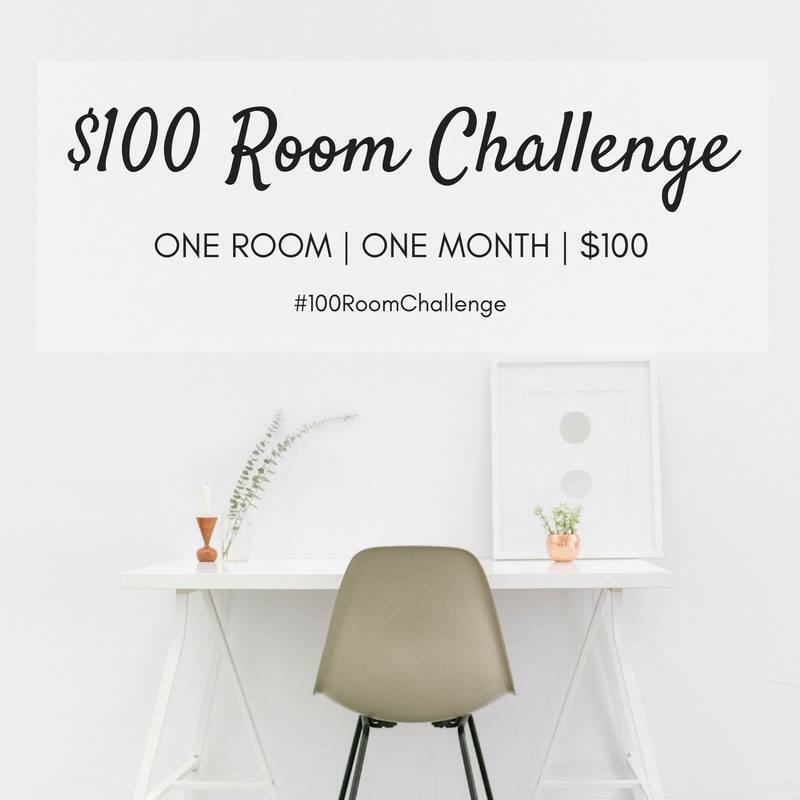 I think people assume apartment decorating is challenging since you’re at the hands of a landlord, but I like a challenge which is why I signed up for the $100 room makeover challenge hosted by Erin from Lemons, Lavender & Laundry. The premise is simple- makeover a room in your home for $100 or less over the next 4 weeks. We will be sharing our progress the next 4 weeks on Wednesdays. I’m choosing to focus on our small, 5×8 dining space. Over the holidays it became a dumping ground for stuff as we unpacked. I finally got it all cleared off and it looks so… beige. So, here’s the plan, and truthfully my goal is to spend as little money as possible and use what I have. I’m going to use leftover temporary wallpaper that’s very close to the famous Tanzania wallpaper that’s been used in many high end homes. You can snag it for under $30 a roll here, and I envision using it on the wall shown below to make the most impact. That doorway leads to the master bedroom. 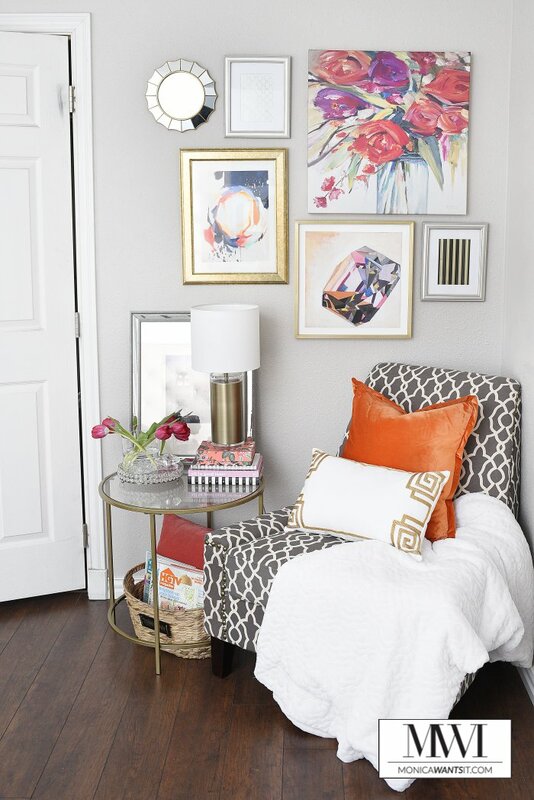 I also want to incorporate a floral wall gallery using the artwork I used in our former master bedroom (see pic below) to give the space some color. I’m going to need to use a lot of Command Hooks/strips for this project. The rug from the dining room at the house will help anchor the space and provide a mega dose of personality. I may add a new throw pillow to the black bench, and I will likely try to find/buy are some baskets that fit nicely under the bench to add in a bit more storage. We will also keep using the same ghost chairs we used in the breakfast nook. Now, what I am on the fence about is whether or not to add in curtains, here’s why. The dining space is right off the kitchen which is all an open concept space adjacent to the living room (which is to the immediate left based on the perspective below). Do I have to get the same curtains I have in the living area (shown below as a refresher) or can I go with something else? I was envisioning simple white curtains to help tone down the beige. Also, I don’t know if it’ll be a pain to impede the flow onto the patio (where those doors lead to), but it’s not like we truthfully go out there often. So…to add curtains or nah? I’d love to hear your thoughts. 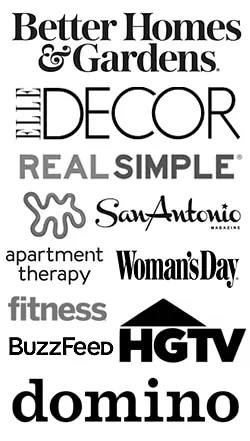 The widget below features all the other bloggers taking the $100 Room Makeover Challenge, and they’re tackling bedrooms, laundry rooms, bathrooms and foyers. Hope you’re left feeling inspired to get creative and thrifty to refresh a space this month. I’ll now be back to my regular 2-3 times a week blogging schedule and counting down the days seconds until this apartment lease is up. Good thing I have a pair of sleep headphones on order to drown out the upstairs neighbor. I love all of the bright colors you have chosen! It's going to be a fun space. Why spend $$$ on curtains for a temporary space? Save the money for your new house! That rug is amazing! I say leave it with no curtains, gives you more to work with in your budget, you can always add them later if you think the room is lacking something. I'd say no curtains if your lease is up and you are about to move 🙂 We went from apartment to apartment for many years until last September, and although I said I'd re-use things, every apartment was different. 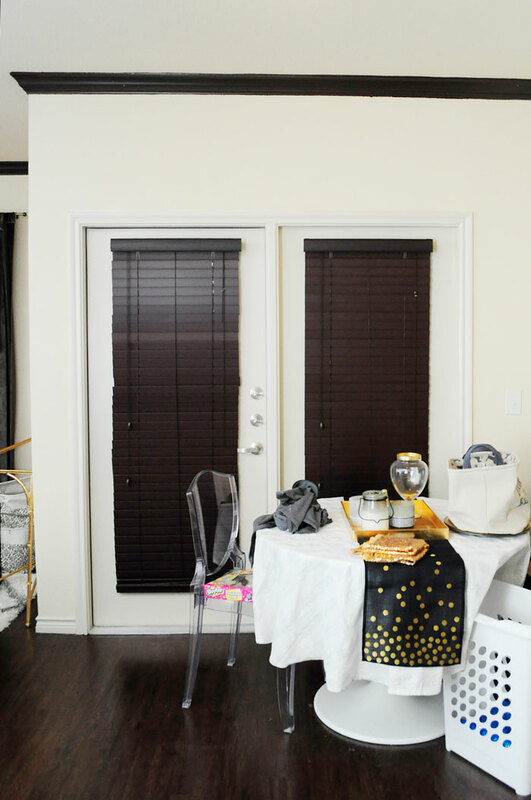 I actually have some Ikea Merte white curtains (http://www.ikea.com/us/en/catalog/products/40111987/) in my spare closet…do you want them?! I promised myself I'd re-use them when I bought them, but they are for 8-foot ceilings, and we have 9-foot ceilings now. 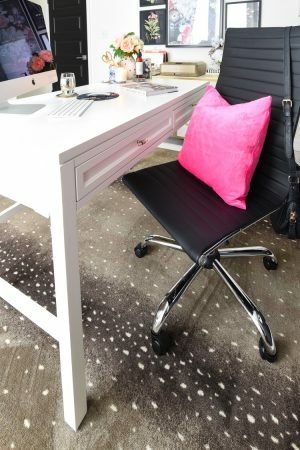 Cute little space either way…and I would have LOVED to have a non-carpet option like yours in our apartments! Looks like the makings of a great space! 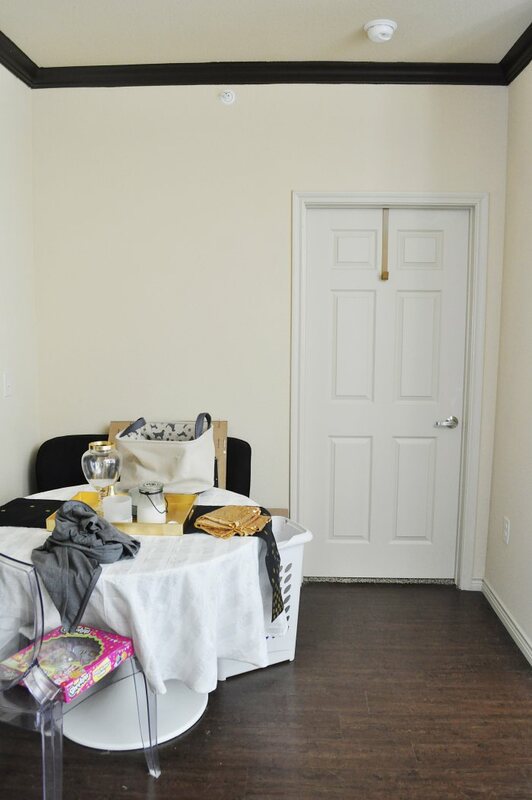 I love that you are taking on the challenge of turning your temporary apartment into a safe you want to be! This is going to be fabulous! I love the rug and art. 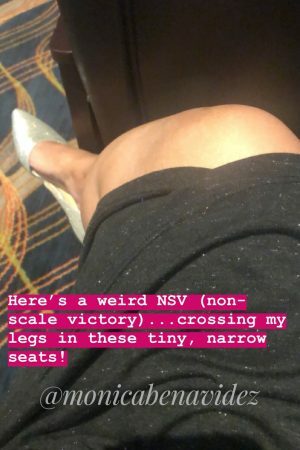 In that small space, the impact will be huge! I actually like that the trim is black, it gives the space a nice detail. Looking forward to seeing how this space transforms! As for the windows, why not a matching (faux?) roman shade? It'll add dimension but not impede the doors. I love all that you have to work with! I hear ya on all the nopes! But having a pretty space will definitely make it easier. 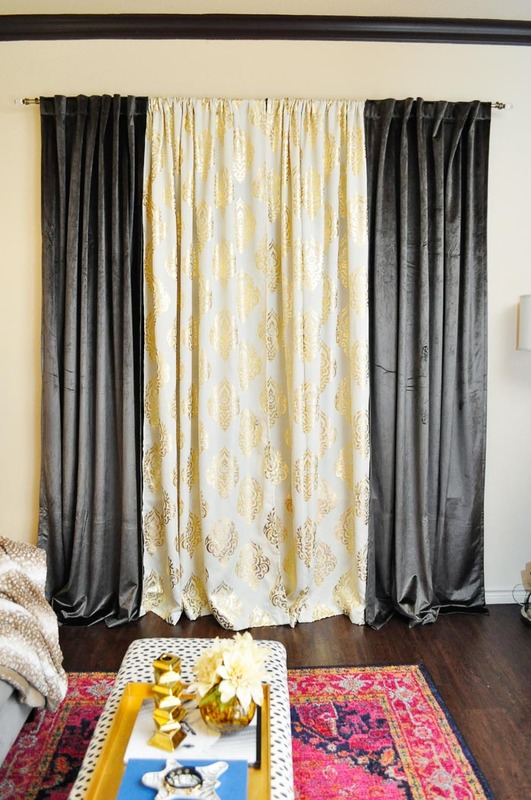 I think you can totally do white curtains. Can't wait to see! 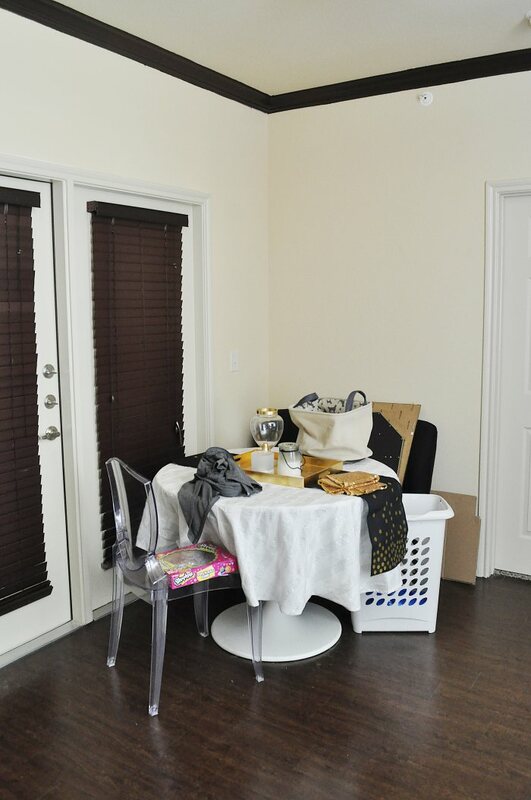 From the looks of the rooms that you are pulling your pieces from, I think you're going to rock this dining space. Looking forward to seeing the finished room! I love the glam look you are going for. That chandelier is fricking fabulous – please tell me you are using that somewhere. 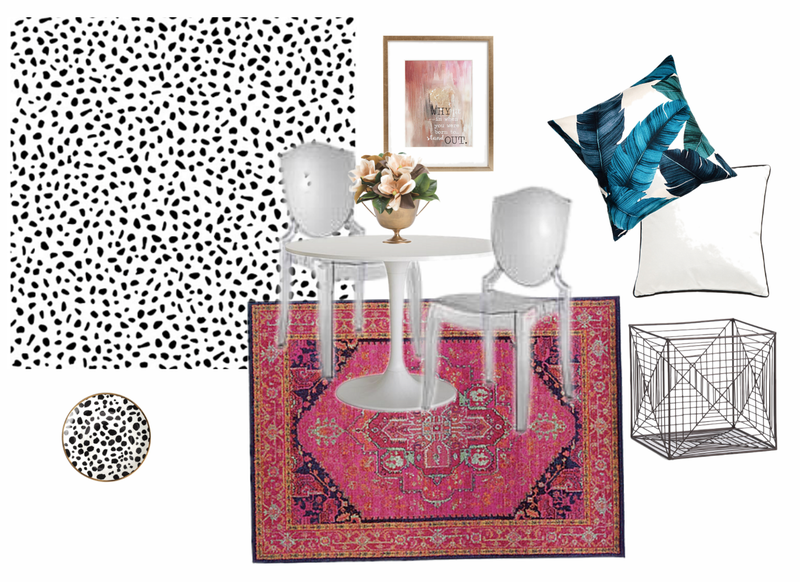 Love your ideas for your dining space, can't wait to see the end result. I would add curtains. I think they complete a room. We added curtains in our rental over the sliding glass doors and just use curtain tie backs to go in and out so we aren't trampling them. I know the feeling of a small space and a house with no soundroofing! I am sure you room will turn out gorgeous. I would add curtains. I feel a room is naked and incomplete without curtains and/or rugs. My thought would be no curtains. Can't wait to watch. So happy to see you back from break! I'll be back any day now. 😉 Ok, so here's my take on the curtains. You're dealing with a small space, so flow is crucial. The blinds must stay as part of the rental, I'm guessing. 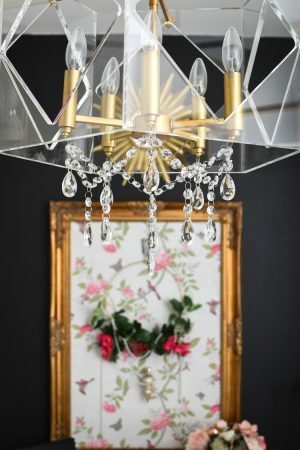 What about hanging the same gilded sheers you added to the living room? They read as neutral and will tie the two areas together without being as heavy as the velvet curtains. Can't wait to see what you do, and color me impressed to be taking on two makeovers this month. I can barely get it together to get one finished. 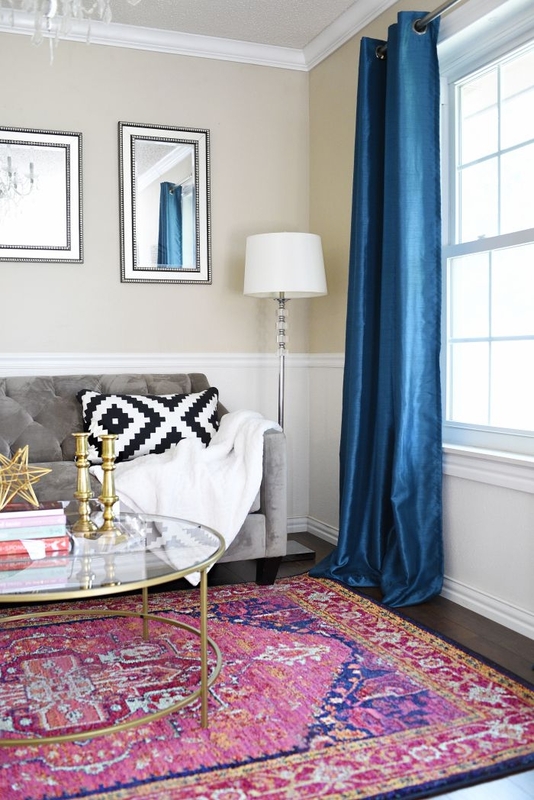 Your colorful accessories will really add some character to the space. I especially love the rug. I would add curtains to soften the area, and I don't think they have to be the same. Probably a soft white like you mentioned would be pretty. Can't wait to see the transformation! Oh dump rooms…ugh! There always seems to be one. Looking forward to seeing your room progress over the next month.